AGC-MCRBA-BCRBA encourage you to help make a difference by donating to the Hurricane Michael Relief efforts by making either a cash or in-kind donation. 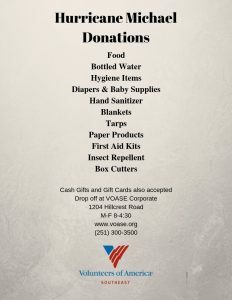 Volunteers of America Southeast (VOASE) is accepting donations for the victims of Hurricane Michael. All donations will go directly to the victims of Hurricane Michael. located at 1204 Hillcrest Road, Mobile, AL 36695. AGC Welcomes New Member: Gulf Supply Co., Inc.